First a disclaimer. I don’t own an iPhone, only an iPod Touch. As such, this is a comparison of the two operating systems, not necessarily the two phones. I had a Motorola EM326g from Net10 (a prepaid phone). Its MP3-playing abilities were marginal at best, so I bought an iPod Touch. Most of the places I go (home, school, and work) all have WiFi, so this combination of mobile devices suited my needs most of the time. But I still wanted a single smartphone that did it all. 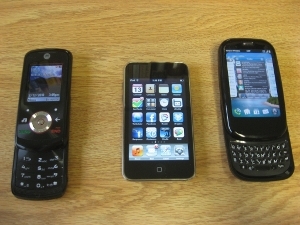 After trying to decide between the iPhone, the Nexus One, and the Palm Pre, I finally settled on the Pre. First of all, the multitasking is phenomenal! With the iPhone OS, I found myself switching apps and having to wait a few seconds for each to load up. I couldn’t go check Twitter in the middle of writing an email without first saving the draft, closing Mail, opening Twittelator, waiting the 4-5 seconds it takes to open, and then scrolling through my new tweets. On the Pre, I simply flick up to go into Card view, then flick over to Twee, wait half a second while it loads the new tweets, and start reading. No time is lost while going between applications because they’re already running. The screen is a bit smaller (1.75” x 2.63” versus 2” x 3” on the iPod). The phone is (I think) also a bit thicker, partly because of the slide-out keyboard. Speaking of the keyboard, I’m still not used to it. I’ve become quite the fan of the iPod’s keyboard. It’s responsive and (once you get the hang of it) can make typing quite fast. The Pre has a physical keyboard with tiny keys. While I’ve gotten faster at it since I first got the device a few days ago, it’s still not nearly as easy to use as the on-screen keyboard on the iPod. Also, the auto-correction (what little there is) doesn’t hold a candle to the intelligence of that of the iPhone OS. The camera seems to take really nice pictures, and it has an LED flash. But beyond that, you’ll have to go to others’ evaluations for more info. On the top, next to the power button, is a ringer switch. It allows you to silence the phone (or put it on vibrate) without having to unlock it and go through menus or push the volume-down button a million times. This is a feature I really like. Touch movements, especially scrolling, tend to be less smooth on the Palm Pre than on the iPod. Also, some of the gestures are simply not intuitive. For example, the gesture to go back to the previous screen in an app (where iPhone OS usually has a left-pointing button at the top of the screen) requires you to swipe from right to left in the “gesture area” right below the screen. Intuition would tell you to swipe in the opposite direction. 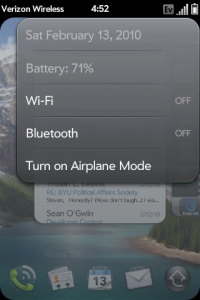 At the top left of the screen in any app is a menu where a few well-chosen commands are kept. This allows you to access the preferences pane for that app or perform copy/paste operations if you haven’t figured out the shortcuts yet. 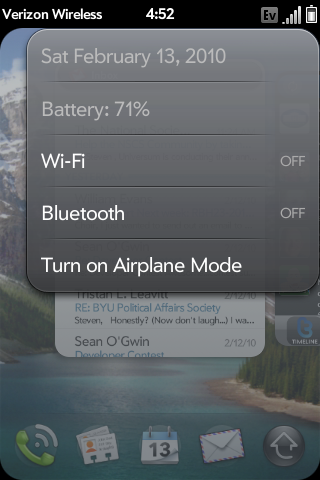 From the upper right corner, you can also access a few system-wide things, such as WiFi, battery level, and Bluetooth (shown at right). The multitasking is a must-have for a power user. It drastically improves my productivity when I have to use multiple apps to get the information I need. With the iPhone OS, in order to avoid spending time waiting for apps to start, I’m forced to make my work more confined by limiting the frequency of app switching. 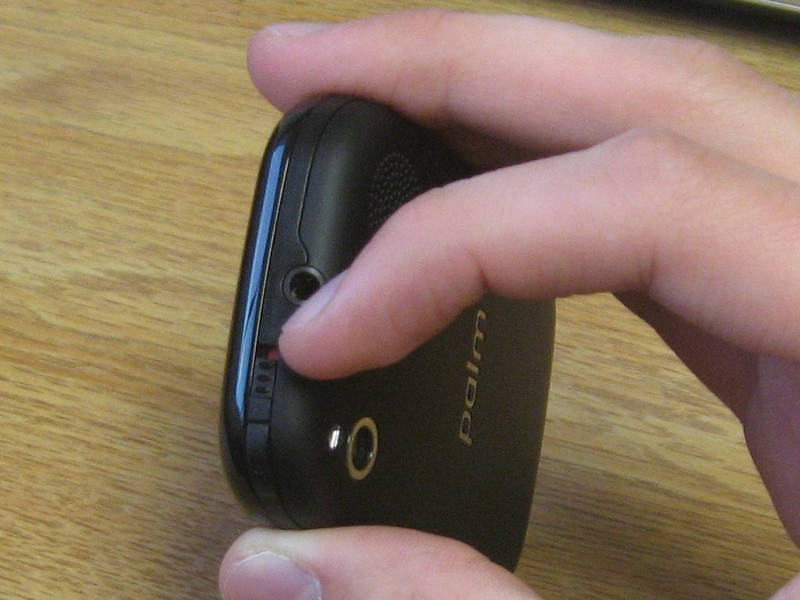 The Pre does have some multitouch gestures, including pinch-to-zoom. 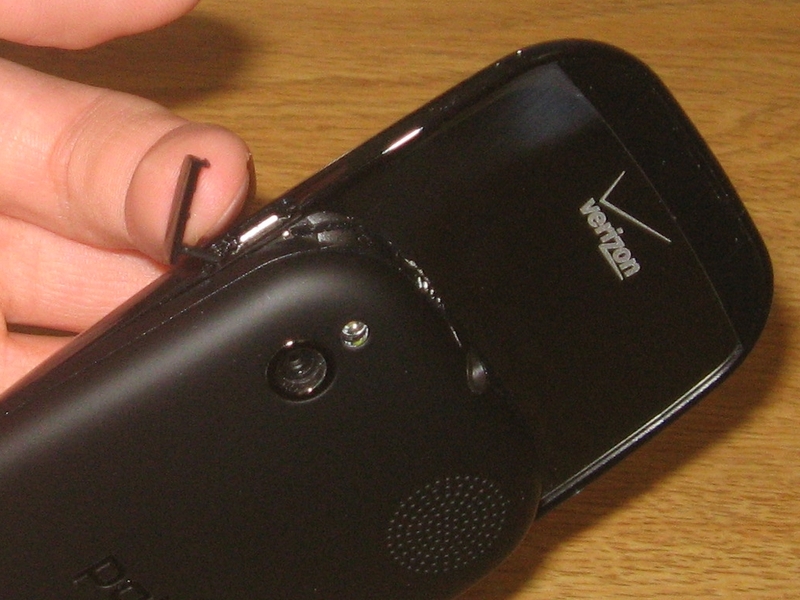 The Palm Pre Plus is carried by Verizon. If you consider that an upside. The Pre’s interface just isn’t quite as smooth, sleek, or responsive as the iPhone’s. 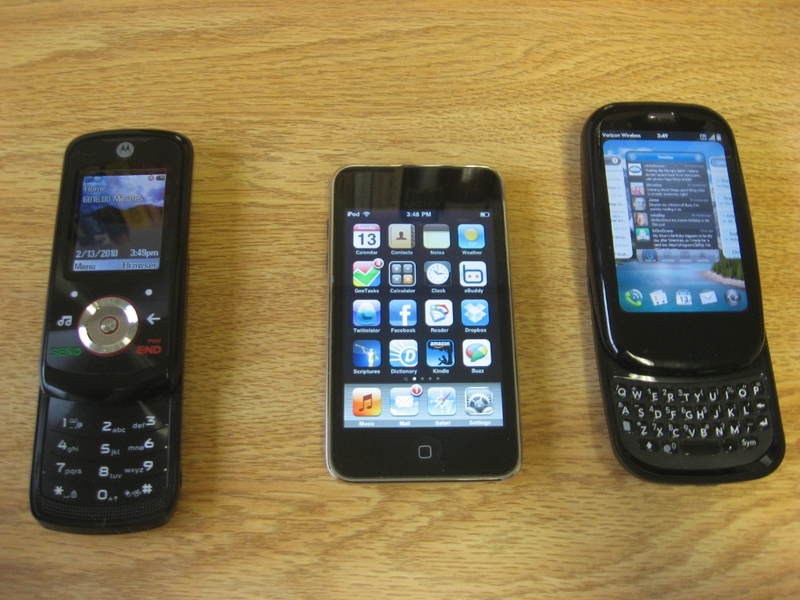 The Palm Pre Plus is carried by Verizon. Their EVDO network supposedly doesn’t support data and voice connections at the same time. So no GPS turn-by-turn navigation while you’re talking on the phone in the car. If you’re looking for tutorials, lists of good apps to get, and other tidbits about the Pre, Totally Palmed is a great website to visit.